A MEMORIAL SERVICE is taking place this weekend in Wexford to commemorate the women who were incarcerated in The Good Shepherd Magdalene Laundry, St. Mary’s in New Ross. 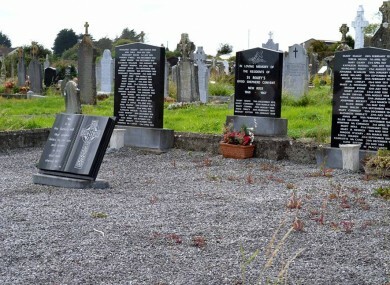 People are asked to meet at the entrance to St. Stephen’s Cemetery, Irishtown, New Ross in County Wexford. The Good Shepherd Sisters apologised for the abuse uncovered in a report last year. They ran four laundries, including one in Waterford which did not close until 1996. In their apology at the time of the report’s release, they said it was “part of the system and the culture of the time”. The date of the memorial, which is being supported by the National Women’s Council of Ireland, was chosen to mark International Women’s Day which is on 8 March but is being held one week early to coincide with similar events taking part in Dublin, Cork and Galway. Adults and children are all welcome to attend the event, which the organisers said is a day “to reflect, lay flowers, read a poem and spend a quiet moment at the graveside”. Attendees are asked to bring flowers which will be placed on the grave of the women. The National Women’s Council have been long calling for the State to deliver on its promise to provide full restorative justice for the surviving women without further delay. Some women have received offer letters detailing their lump sum and weekly payment entitlements, yet this Government has failed to deliver on the promise of pensions and healthcare benefits, as well as all other elements of restorative justice called for by Justice Quirke. Orla O’Connor, Director of NWCI, is also on record as stating that it is “unacceptable” that these women “have still not received the justice called for by the United Nations Commission Against Torture, and promised by the Taoiseach himself”. The memorial service will take place tomorrow at 12.30pm. For more information, click here. Email “Memorial for those incarcerated in Wexford Magdalene Laundry to be held tomorrow”. Feedback on “Memorial for those incarcerated in Wexford Magdalene Laundry to be held tomorrow”.